I want to give you a sneak peek of Step 1 of Judgment Detox. It’s called Witness Your Judgment Without Judgment. This first step alone can bring you incredible relief and completely resolve some of your judgments and resentments! 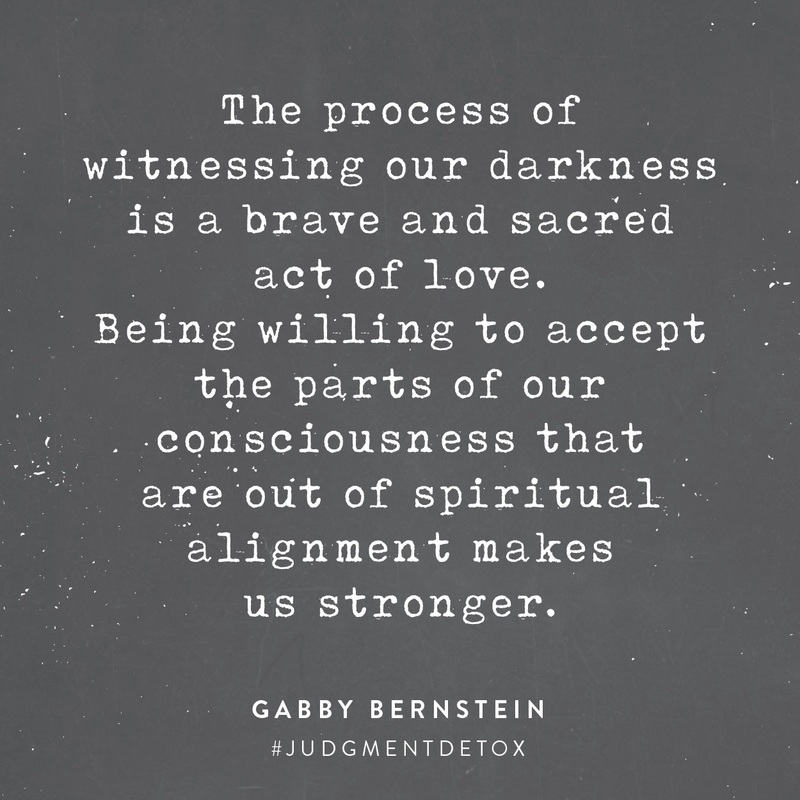 But before we dive into how to heal judgment, let’s talk a little about why we need to heal judgment. I believe that judgment is at the root of all our problems, from the pettiest disagreements to the most catastrophic world events. Our belief that we are separate from one another leads to gossip and bullying as well as deep divisions and violent hate. Healing judgment is extremely urgent right now. I created a video that shows just how pervasive it is and the harm it causes. Before going any further, watch this video. You’ll quickly understand how important it is that we heal judgment. As you can see, judgment is no small matter. The world is desperately in need of lightworkers and healers. Furthermore, healing your own judgment doesn’t just help you. It creates a ripple effect that will be felt by everyone you come into contact with. It will radiate energetically far beyond what you can imagine! That difference is critical. Witnessing your judgment is a brave and sacred act of love. I want you to remember that, because witnessing your judgment can make you want to judge yourself for judging. Doing this only gets you further tangled up in the judgment cycle. Instead, I want you to understand a few things. That’s why I wrote this book. I judge every day! We all judge. Accept that you judge. Accept that we all judge. You will come to understand why we do it. You don’t need to get rid of judgment altogether. First, there are some judgments we need (I go more into this in the book). Second, you can’t control every thought that comes into your mind. You’re not some perfectly enlightened being. You are human! The goal is not to never judge — the goal is to witness judgment, forgive the thought, release it and choose again. Eventually this will become second nature! Witnessing is the first step toward healing. Witnessing is the first step toward healing any kind of behavior or negative pattern. It takes courage. I applaud you for having that courage. If you weren’t willing to heal your judgment, you wouldn’t be reading this right now. Being brave enough to witness your judgment without judgment is liberating! You will feel an incredible sense of freedom from Step 1 alone. For a long time you’ve been denying and rationalizing your judgment and feeling guilty, consciously or unconsciously. That guilt is about to transform into clarity and relief. In Step 1 you will take an inventory of your judgments. When we take an honest inventory of the ways we judge, we can become aware of the root cause of all our suffering: our separation from love. At our core we are loving, kind, whole, healthy and compassionate people. But over the course of our lives we’ve separated from that love and wholeness. We’ve become fragmented beings with dark, scary parts. In many cases judgment has been our greatest defense mechanism. We have used it to defend against our vulnerability. We’ve built up a wall against the presence of love and grown to rely on judgment as our protector in a world full of fear and trauma. We put enormous effort into hiding our vulnerability, but it’s our vulnerability that truly heals us. When we feel safe enough to expose our shadows, that’s when we become free. We don’t have to protect our shadows any longer. We can begin to dismantle the wall that separates us from real, authentic, fearless love. By witnessing our judgment we take down the first brick in the wall and peek at what’s behind it. We can see our shame, fear and feelings of separation. Uncovering our true feelings helps us understand our triggers and honor our wounds so that we can work through them. When we witness our judgment, we accept that it was merely a defense against our wounds. Today you can prepare yourself with a 2-step exercise that will lay a foundation for the work you’ll do in the book. You can do these steps throughout the day. They will help you become aware of judgment and practice being the nonjudgmental witness. What does it feel like when you judge someone? Do you feel tired, angry, restless? Do you get depressed? Does your energy plummet? Does a knot tighten in your stomach? Open your journal and just jot down what it feels like to be in judgment. When you notice yourself judging, ask yourself a simple question: Am I looking through the eyes of peace or am I looking through the eyes of judgment? Asking this is a prayer. You become the nonjudgmental witness of your judgment and you open up to the possibility of seeing differently. This two-step practice will prepare you for the beautiful work you’ll do in Step 1 of Judgment Detox. Let me know how this exercise goes for you! Leave a comment below. What have you noticed by being the nonjudgmental witness of your judgment? What does it feel like to judge? What does it feel like to be open to seeing things differently? Leave a comment, and be sure to get Judgment Detox today if you haven’t ordered it already! This 2-step practice helped me to slow down my breathing and to feel a profound sense of peace. 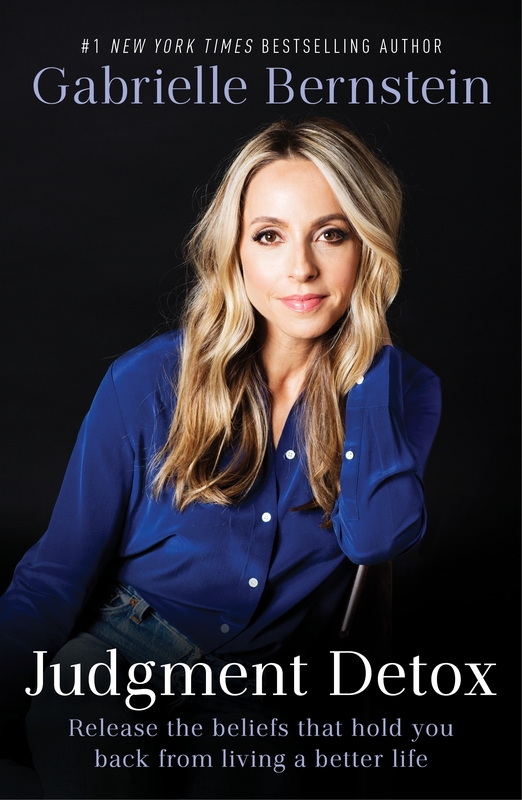 I am looking forward to read the Judgment Detox book. Much Gratitude and Love. I find it a great idea to become aware of our judgment. It could make the world a much more beautiful place. Hopefully i can buy your book some day in dutch. Yesterday, I became angry with my friends who were gossiping. Really angry. I threw my phone down and decided to take a shower. And then it hit me. I was judging my friends for judging others! So silly! I yelled to my husband from the shower when I realized. We are all human. I am excited for your book! Happy 2018! The video is powerful! I can’t wait to receive your book tomorrow and begin. Happy New Year, Gabby, and all Friends! NEW year sounds encouraging and reminds me of day #1 in a dual diagnosis treatment center 17 years ago! I count my blessings every day (yes, every day) and have done so each day of these 17 years of being wine-free. This has not, however made me whine-free! With all that The Universe has provided thus far, the biggest gift has been the ability to forgive myself, on occasion. Of course, I have not been perfect at anything except not drinking, which is a HUGE blessing, as you know. And so, I look forward to the delivery of your new book and to adding new tools to my toolbox. I, too, remember that “it is about progress, not perfection.” Many, many thanks for sharing from your heart about so many delicate issues that need to be addressed. You are love. God bless you and yours. The video was beautiful! So so true with everything that is happening in the world right now. I had to share it immediately on Facebook so that my friends can see it. I can’t wait to get Judgement Detox and start 2018 with it. Thank you Gabby much love to you and all that you do for all of us. I can not wait for my book to come. We all could benefit from the self help teaching that I believe will be in it. Thank you for always helping me to focus on myself in hopes of then passing good vibes to others. Thank you Gabby for bringing awareness to this and for showing how we can work with it! It can help ease suffering in so many ways! I can’t wait to get my book this week! This work is so important. Thank you, Gabby! And dear Gabby, thanks for these insights. Wow, I totally require reading your new book!!! I’ve been following and growing along with you since 2015 and I LoVe to see how far I’ve come. With that said, I’ve been totally judging nny family and friends for being so judgmental and how “they just don’t ‘get it’!” Meanwhile I’ve been just as judgey!!! Cannot wait to begin this judge-less journey, thank you for all you share! My 2018 intention is to become better aligned and balanced to clearly share all I’ve been learning, so i can too help those I care about, and anyone willing to listen. Cheers to a peace – filled 2018!! Thank you for an exceptional video and your blog about Witness Your Judgment Without Judgment. Judgments =Defense mechanism. Perfect timing of the email for me to notice what it feels like to be in Judgment. I would love to share with you my emotional roller coaster. I start to get angry, hurt, and sadness that will eventually lead up to my weakened immune system. I looked for to pick up my book Friday night at your book tour event. I need to dig into my core feeling of why I tend to judge when it continues to hurt me in the end. Thank you for your continuous ongoing spiritual journey. Hey Sandy Thank you for sharing, its normal we all tend to judge dont be so hard on yourself. Perhaps just channel your energy as to where its coming from and maybe if it brings about a negative memory that affected you. I tend to write about it and transfer my energy to paper. I hope it helps let me know how it works & I look forward to connecting with you on Friday! Thank you for your inspiration. I appreciate it, Just this past week my not so sweet high school sweetheart told me he no longer wanted me in his life and to imagine the knot in my stomach hearing that after 13 years! I was literally a young girl who fell totally in love with his bad boy attitude and sensitive brown eyes. I noticed my body feel weak and I just remember sitting there crying. It took a good 24 hours and ice cream and listening to your meditations to just accept how I feel and trust in time to heal. However today, when I read your blog about 15 minutes after the thought lingered in my head wow he truly didn’t even wish me a Happy New Year? I stopped and paused and I continued reading your blog and realized perhaps am I judging him maybe? I also started to look deeper into my train of thought and the entire scenario how he just ended a 6 year relationship with his fiance and even though we where friends we mutually got busy with our own lives and relationships until all out of the blue he reached out in July and told me he and his fiance broke up. I was in shock I honestly had dreams about him and felt his energy in some way and I thought he was awaiting a baby. I never even though the two of them would be over. He was in LOVE he even put on weight, learned to cook and clean and got a puppy. I tried everything, I suggested reading your books, meditation, prayer, and everything was no and I was the crazy one and I was the impulsive texter and I just realized he is still in mourning. I feel this coldness around him and I am a total Scorpio I love to love and everything in between. I guess this all fit to say I was judging him. Perhaps if you can shed any light on the best way I can address my feelings and also be respectful of his without feeling disappointing or even angry for him to up and dismiss me when I was nearly hand and foot trying to love him and be a genuine friend id appreciate to hear your feed back. I have been a student of yours and others like you for a long time. I am more aware now than I have ever been and I wanted to say thank You! I intend 2018 to be a beautiful year in my spiritual journey. Judgement Detox will be step 1. Happy New Year to you! HI Gabby what a great way to start the new year! I started a cleanse and detox the negative judgment I was faced with the last few days of christmas and boy did it test me! I remember it says in the holy bible about judgement how we shouldn’t judge others christ didn’t come here to judge he came so he can be living example for us. I started my journey on 1/01/2018 feels amazing! Love Gabby and looking forward to seeing her in Boston this weekend! I can’t remember who I learned this from but for the past year, whenever I find myself judging someone, even myself, I send a silent blessing. It’s been transformative. Thank you Gabby for your wisdom and unconditional love! I’m so excited to receive the judgement detox. Such important and relevant lessons to be taught and learned! I would like to Thank you Gabby and I would also like to take the opportunity to thank myself (which is something I don’t normally do). For allowing my inner guide to be open to receiving word about your new book – a topic I feel i have been overcomplicating and in turn becoming just that. I am a very positive person, who has always trusted in the universe and inspired many people by living my truth. However, this passed year have found myself more than ever so judgemental of myself… The fact that I don’t feel as though I have achieved any results financially. After completing Step 1 above – Taking an inventory of my judgements. All of a sudden I have been able to lift the self imposed pain & judgement. I have a new found faith & desire within that whenever I choose to witness my judgements without judgement, that I can embrace feeling vulnerable and also have the courage to choose love over fear. Happy New Year Gorgeous Gabby and wonderful Team! Thank you for every aspect of this brilliant inspiration and all of the Love which empowers you to inspire us with the Truth that will set us free. The videos drive it home directly to the heart and soul. All day long -and for the very FIRST day of 2018- I prayed for healing. I was ready to accept a gesture that keeps me out of darkness. It worked well when I decide to welcome any kind of LOVE into my heart. Hi Gabby. I’m excited to begin reading your book and starting 2018 in a positive place. Any chance that you might come to Minneapolis? I won’t be there for my book tour but if I am in Minneapolis anytime soon I will make it known far and wide!! I find it so difficult not to judge. It’s hard work. I think about one of your other pieces of advice to send love out into the world, but so many people make me angry. I pray every night to find more patience. I just quickly jotted down some notes on how I have judged today – and in less than 2 minutes I had 6 scenarios!! I’m looking forward to exploring this some more as I did catch myself and choose again in a number of these moments. You will love the Judgment Detox!! I am so excited for this book to arrive! I am hoping to be able to read it from cover to cover before Saturday when I see you in Ridgefield. I have been judging myself more than anything lately… Why is that??? And when my husband and I are having a conversation that it not in alignment with myself and the ways to solve the issue I judge him. Looking forward to breaking free of this cycle!! First of all I wish you all a year full of love, wonder and growth. When I’m judgmental there’s this little ball of energie blocking my solar plexus. When I don’t pay attention this ball will grow blocking my third chakra completely. Thanks for making it so simple to let it flow again. Looking forward to seeing you in Boston! The world (and I) need a lot less judgement. It’s so easy to lapse into judgement when you’re surrounded by it all day long. Thank you for giving us tools to break out of the cycle! Read the first chapter last night. I am so excited to gobble up the whole book (I usually read a book in two days) but trying to take my time and really spend some time on the exercises and thoughts, so I am limiting myself to one chapter a day tops. Who knows maybe I’ll need more on a couple of them, especially the one about dragging our past along with us. Thanks for the honesty and kind words you’ve put into this! Amazing. I’m so happy it’s serving you. Can’t wait for LA!!! I just saw you speak in Boston. I wanted to tell you this: It took me many years to find empathy in the face of cruelty. In no longer judging and holding on to my anger, I feel a profound sense of peace. It is good your book can help people find this. I hope this message of appreciation will reach that side of you that worries about your value. What you do is important to share regardless of any mistakes you make. It is very important to make those mistakes. Your increasing awareness is an asset to the work you do. Thank you for sharing this miracle and being part of this movement.